A centrifugal pump provides your facilities with the durable and reliable operation you need to process and transport fluids efficiently. At Phantom Pumps, we offer centrifugal ANSI pump products along with services such as pump installation, maintenance and repair, part selection, cross-referencing, and custom turnkey pump packages. Reliabilty – Our high-quality centrifugal pump products are made of durable metals, like titanium alloys, to increase their strength and longevity. Reduced Pump Maintenance Costs – Utilizing Phantom Pumps parts in place of genuine manufacturer parts during in-house repairs saves you money each quarter. Increase Operation Efficiency – With our efficiency-minded parts, you can boost the effectiveness of your pump without paying full price for a model. A centrifugal pump requires a few components to operate. Engines move the fluid through the pump. Then, the pump impeller takes fluid through the pump’s cavity and moves it into a rotating axis. This axis then pushes your fluid outward towards the exit. This design is fundamental and purposefully simplified to minimize the number of parts and processes necessary for each step. Along with centrifugal pump and ANSI pump models, Phantom Pumps manufactures high-quality parts for your facility, including various strainers for eliminating solids from your liquids, valves, shafts, gearboxes, motors, and much more. Our team of engineers are available to assist you with our cross reference guide and guide you through selecting the right pump for your facility. We have the ANSI pump, DPump, low pressure, or high pressure pump model you need to replace your Gorman Rupp, Warren, or Viking Pump equipment. Phantom Pumps is proud to serve facilities in Colorado, Ohio, New Mexico, Michigan, Tennessee and across the USA. If you are looking for ways to reduce your operational cost without sacrificing quality, contact us today to learn more about your options. 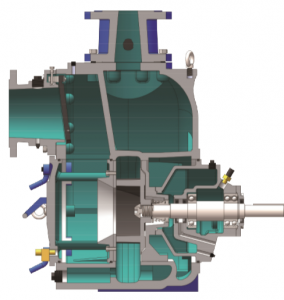 We can provide you with the centrifugal pump that you need for your facility.